Timing could not have been any better for an escape from the pangs and doldrums of hammering out yet another 60 hour work week. My best friend, travel buddy extraordinaire, and bliss finding buddha of a girlfriend found a great weekend retreat months ago and booked it (intuition perhaps) for this past weekend. The sweet saving grace of nature could not have come at a better time. We’ve been physically and mentally stretched out to our thinnest skins lately due to work and outside stressors that have been knocking on our doors like relentless landlords asking when the late rent will be in (I get paid next week, I swear). The website for this trip was often referenced during the most bristly and ruthless moments during the week as a saving grace. It was our light at the end of the tunnel. Friday could not materialize fast enough. We packed my truck and hit the road Saturday morning heading north towards Pittsfield, NH. This weekend had some goals in mind but one was far more important than the others; we needed a reset button. We armed ourselves to the teeth with fall themed food ideas, comfortable clothes, some travel related reading materials, and some ideas of things to do (but not an itinerary, as that would defeat the point of this do-what-feels-right kind of vacation). The road off the main drag brought us through Antique Alley (Rt 4) and past multiple podunk settlements while the trees were showing some signs of fall. Unfortunately I think the wrath of Irene about month ago made fall foliage sparse. Trees were either bare, green, or had some samplings of what fall could be. But there was still the nostalgic magic of autumn with reds, oranges, and yellows dappled throughout the forests we found. We passed a stream that lead to a small lake with a warm yellow sunset showcasing pristine maple trees in full color proving that fall was indeed still here and there, you just had to look a little harder. I naturally flew past the turn we were supposed take in one of my distracted moments of thought or sight seeing. Getting off the little highway brought us on small, windy town roads that eventually turned into gravel and dirt. The road our destination was perched on was just wide enough for one vehicle to comfortably fit. I couldn’t picture two vehicles taking these sharp, tree canopy covered turns together. We had to stop and take a picture of the entrance sign we arrived, both taken back by the little gravel road that disappeared into the woods ahead of us. This is what we had come for, and instantly felt the yesteryear natural feeling that this beautiful area represented. 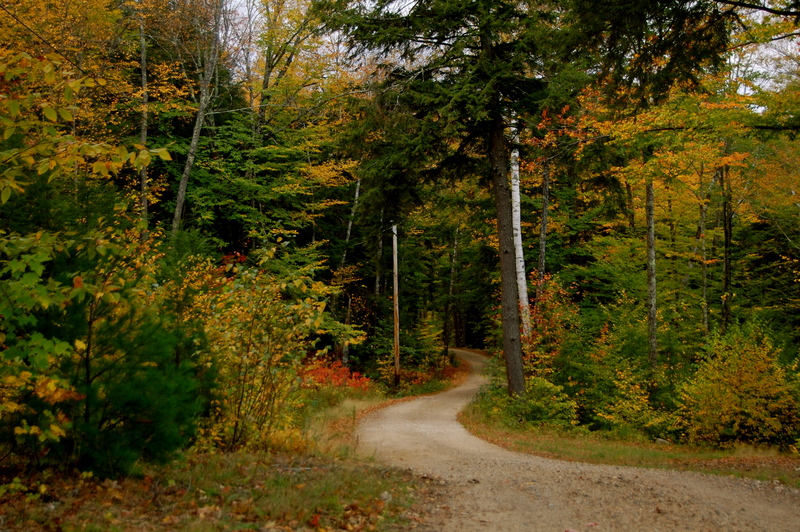 The winding gravel road brought us to our cabin, complete with wooden chairs, tables, and benches carved from trees surely cut down from somewhere on this property. 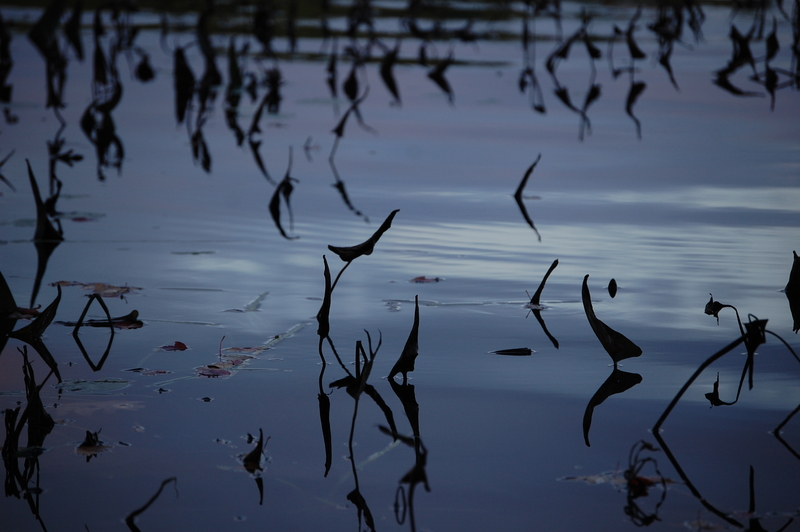 The view opened up to reveal a large pond and marsh with leaves finding their way to the ground aided by the blustery winds from the southwest. We quickly packed the food in the fridge and walked down to the pond to catch the last rays of light diminish. We found a dock to welcome the night in, stocked with canoes and kayaks waiting for water adventures. 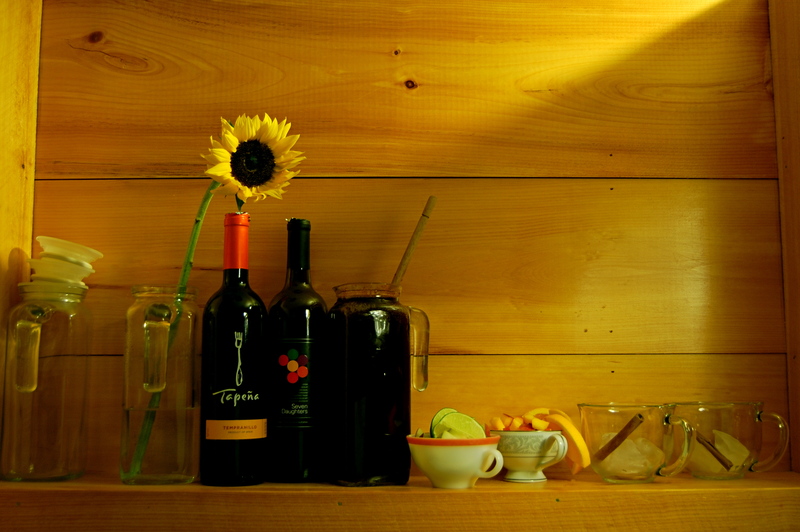 The weekend was full of delicious homemade concoctions from roasted chicken, sweet smashed potatoes, fried rice, freshly made sangria (a blend of tempranillo and Seven Daughter’s), chicken potpie, sweet bread French toast, and of course bacon. 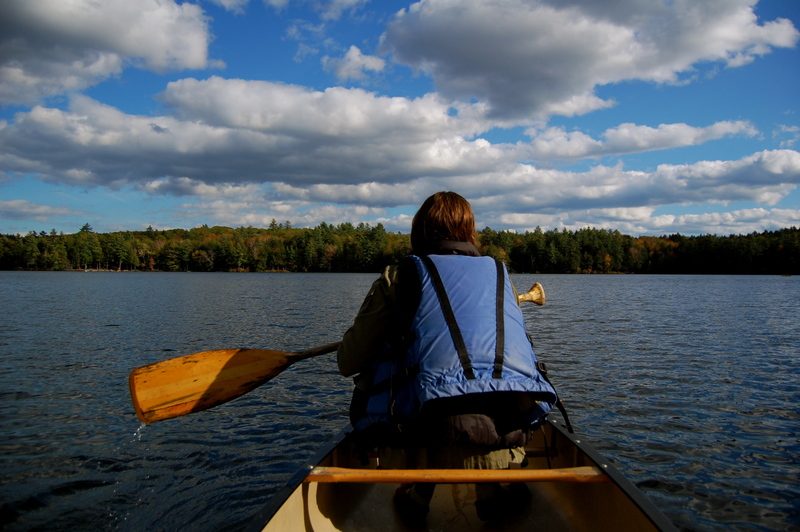 Hiking through the woods and paddling on the windy open waters of the pond were the only things to focus on out here. It sounds cliché and annoyingly “urban hippy” but when you take in a deep breath of air out there it really did feel clean, reviving, and refreshing. This was done many times. Sleep was also a notable accomplishment and I can honestly not remember the last time I slept for 12 hours straight. The weather was perfect for fall and we even were allowed a heavy rain beneath the protection of the awning on hand made wooden rocking chairs. An outdoor shower complimented the entire experience with perfect views of mossy boulders, trees, and squirrels fighting for acorns. Before we knew it the escape to the woods was over, but not before a quick pit stop into Portsmouth, NH to walk about and grab a hot apple cider. Fall is here and I welcome it with open arms as I always have. This trip completely made us forget about the hustle and bustle of the demanding workload we both have, and I’m finding it increasingly important to take myself out of that mode more than ever lately. I suggest everyone go out there and get away from the normalcy and comforts of your surroundings. 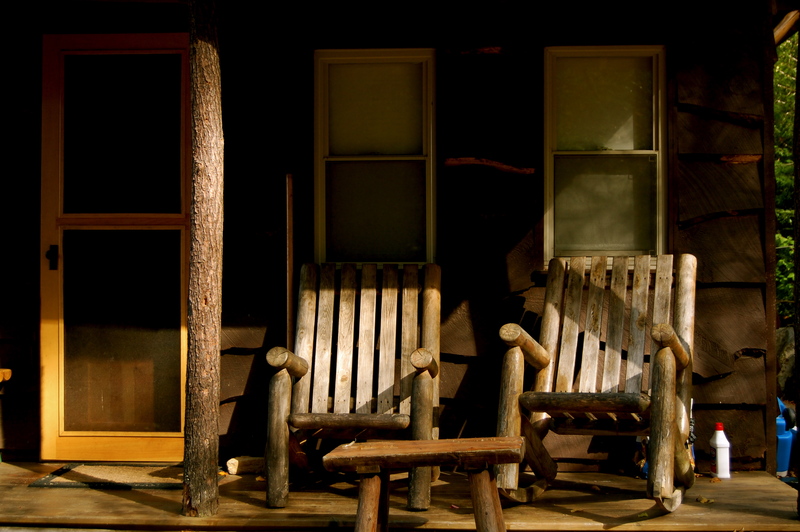 Granted I know we were not roughing it by any means, but not being connected to the world via communications (TV, internet, etc) is a great way to get back to the basics and reflect on life. 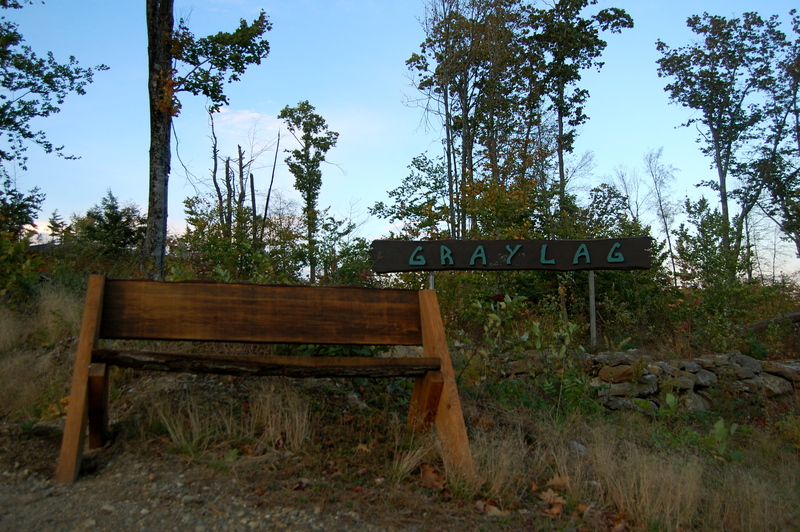 Visit http://www.graylagcabins.com for more info.